Godrej Process Equipment, a unit of Godrej & Boyce Mfg. Co. Ltd., today shipped one of the World's tallest Continuous Catalytic Regeneration (CCR) Reactor to Dangote Oil Refinery, Nigeria. With a gigantic 95 meters height, the CCR Reactor is 22 meters taller than the Qutub Minar and weighs approximately 703 metric tonnes, nine times heavier than a space shuttle. Speaking about the achievement, Mr. Jamshyd Godrej, Chairman and Managing Director, Godrej & Boyce stated, "We have always been in the forefront of adopting technology to offer the best-in-class solutions to our customers. The manufacturing of this complex reactor, the tallest in the world, and the shipping of it in a single piece is a matter of immense pride for us. It is a testimony to our company's vast technological expertise and also showcases Indian engineering capabilities. 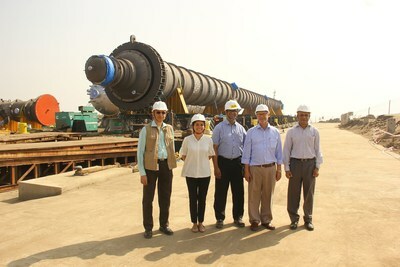 The successful manufacture of this equipment only adds to the achievements of Godrej & Boyce and its global footprint." Adding to this, Mr. Allen Antao, Executive Vice President and Business Head, Godrej Process Equipment said, "Godrej Process Equipment is a leading global fabricator of high end critical static equipment for the Process Industry. For several decades now, customers from around the world have come to rely on Godrej for their operationally demanding equipment needs. The CCR Reactor built for Dangote's Refinery in Nigeria is the latest in the long list of capability challenging equipment built by Godrej." Godrej Process Equipment is one of the fourteen businesses of Godrej & Boyce, with the largest global footprint in the G&B group. Godrej Process Equipment is a leader in manufacturing custom built process equipment such as Heavy walled Reactors, Pressure Vessels, High Pressure Heat Exchangers, Columns, Trays and Reactor Internals for various critical applications in the Oil and Gas, Petrochemical, Fertiliser, Power and Water sector across the globe, with over 80% of their products being exported.